Austin, TX – We are extremely disappointed to learn that the Trump Administration’s response to widespread demand to end the separation of families is to instead keep them detained indefinitely. The Executive Order, signed this afternoon, is unacceptable for several reasons. First, it continues to perpetuate the myth that family separation is the product of bad legislation or court decisions rather than a cruel and deliberate policy choice made by the Administration. Second, thousands of families have already been torn apart by this Administration’s policy. This new Executive Order does nothing to help those who have been cruelly separated. Moreover, it does not guarantee an end to family separation as the temporary family holding facilities contemplated in this EO lack the proper licensing to detain and hold children. Rather, it introduces even more uncertainty into an already chaotic immigration process. “We urge on the Administration to reconsider the policy outlined in the EO drafted today and instead implement community-based and humane alternatives to family detention and separation,” Lightsey. American Gateways is an Austin-based 501(c)(3) non-profit that has served the Central Texas immigrant community for more than 30 years. Our mission is to champion the dignity and human rights of immigrants, refugees and survivors of persecution, torture, conflict and human trafficking through exceptional immigration legal services, at low or no cost, education, and advocacy. With offices in Austin, San Antonio, and Waco, we serve 20 counties throughout the region. American Gateways conducts screenings for services on a walk-in basis. Screenings are done at the Austin office from 9:00 AM to 12:00 PM, Monday through Thursday. Screenings are conducted at the San Antonio office from 9:00 AM to 2:00 PM, Monday through Thursday. No appointment is necessary at either location. 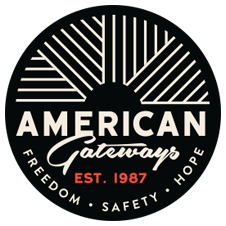 American Gateways is a 501(c)(3) nonprofit corporation. Amazon Smile is the same as your regular Amazon account – sign up to donate a portion of your purchases to us. American Gateways realiza cuestionarios para servicios en bases de entrada. Los cuestionarios se realizan en nuestras oficinas de lunes a jueves, en Austin de 9:00 AM a 12:00 PM; en San Antonio de 9:00 AM a 2:00 PM. No se requiere cita previa. Tambi&eacuten ofrecemos servicios en Waco, TX con previa cita. Por favor llame al (512) 806-6531 para agendar una cita. Si no es posible venir a una de nuestras oficinas, favor de llamar al (512) 478-0546 extensión 200.